For Designer, Metallic and Gloss colours, download the ColorCote® special colours brochure. Looking to add interest to your design or project? Consider the bolder look that Eurotray® Angle Seam offers. This member of the Eurotray® family lends itself well not only as a striking roofing profile - but as an exceptional wall cladding solution as well. 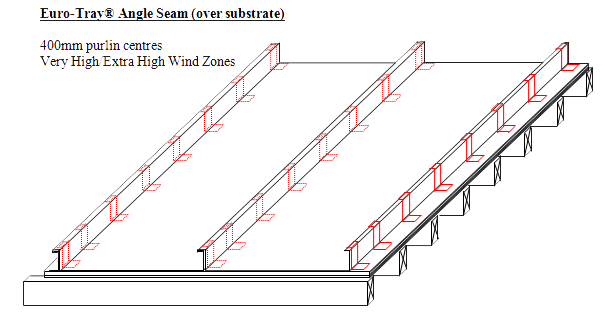 In cladding situations, Angle Seam can be run both vertically or horizontally. Angle Seam can also be concave curved. Unless specified otherwise short sheets and flashings will usually be made on an automatic bending Raz machine. Ensure to state on the order "manual folding required to 10mm minimum bend" when ordering short sheets or flashings because some manufacturing locations have Raz machines with 11-12mm minimum bends. **Please contact your Dimond Roofing 0800 Dimond (0800 346 663) for availability. Curving facilities: Machine is transportable. For curving restraints check with the local RoofingSmiths. Sheet lengths: Eurotray® is custom run to order. Photovoltaic laminates (PVL’s) can be installed on to this profile at an additional cost when the cladding is completed and other trade have finished or it can be installed at a later date. Eurotray® Angle Seam roof cladding must always be installed over a plywood (12mm minimum) substrate with a moisture content of less than 18% and made wind tight, with purlin supports underneath at 600mm centres in low to high wind zones and 400mm centres for very high and extra high wind zones. 8g x 40mm countersunk stainless steel screws at 150mm centres around the panel edged and 200mm centres on the intermediate supports. The fasteners should be no closer than 10mm to the edge when using Zinc avoid contact with Bituminous paper underlays and use Covertek 403. A 3mm expansion gap should be provided between the sheets. All joints should be staggered and taped over before placing underlay, Dimond Roofing recommend the use of vented type underlay. This allows added air-flow between the underside of the tray and substrate, it also helps to reduce oil-canning in the tray. Fasteners that are used to secure Eurotray® down as a roof cladding must penetrate through the substrate and into the purlin a minimum of 30mm for timber and 6mm for steel purlins. For wall cladding the fasteners must be long enough to pass through the substrate, cavity batten and into the main frame by 30mm for timber and 6mm for steel. Fasteners must be fixed closer together on the periphery edges of all roofs in areas of High to Extra High Wind Zones. 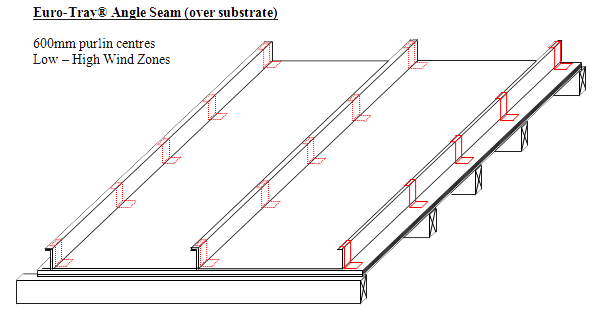 Unlike profiled metal cladding, the point load imposed on a fully supported cladding is supported by the substrate underneath. 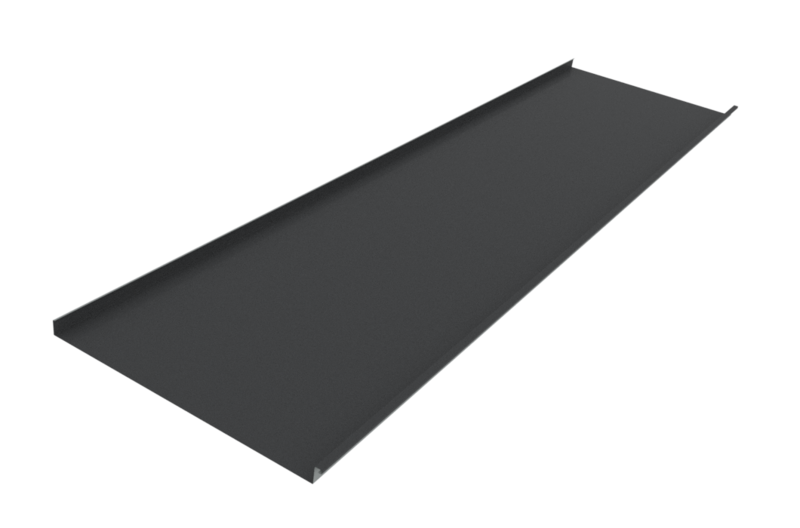 Minimum pitch for Euro-Tray® Angle Seam is 5 degrees. Flashing and jointing details when using Copper or Zinc materials are required to be solder, silicone sealants are not to be used on these materials avoid contact between zinc and Bituminous underlay. Recommend Covertek 403. Below you will find all of the relevant product CAD technical details in .dwg, .pdf & .rvt format. If you have any questions regarding the details below please contact one of our technical team on 0800 ROOFSPEC. Need a brochure for one of our rainwater profiles? Here you can download our brochure with the basic information and details you need during the decision process. Below you can download our homeowner’s brochure which includes some of our profiles and basic product information for homeowners when re-roofing or building new.